Tomorrow is National Skirt Day. Based on the snow in my front yard this morning and the track meet I will be attending tomorrow afternoon, I will not be celebrating this particular holiday by wearing a skirt. 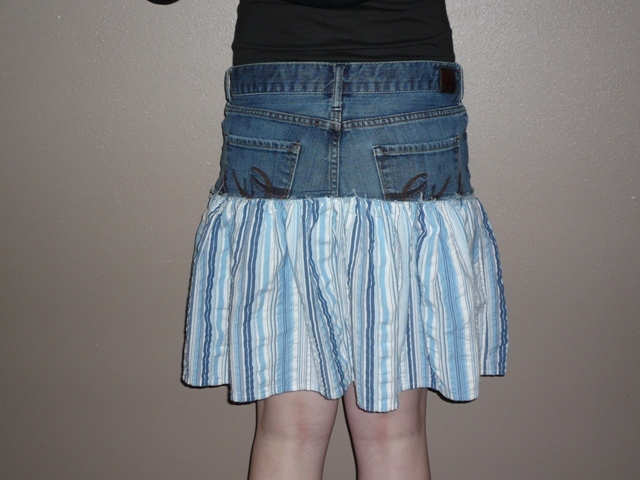 However, I am going to celebrate by telling you about another skirt I made out of a pair of jeans. I know it must seem, at this point, like this is something I do all the time. Nope, this is the second one ever. I love how it turned out though, so I'm sharing. Start with a pair of not-too-stretchy jeans (learned my lesson on the last skirt). Pin pockets up so they don't get cut. 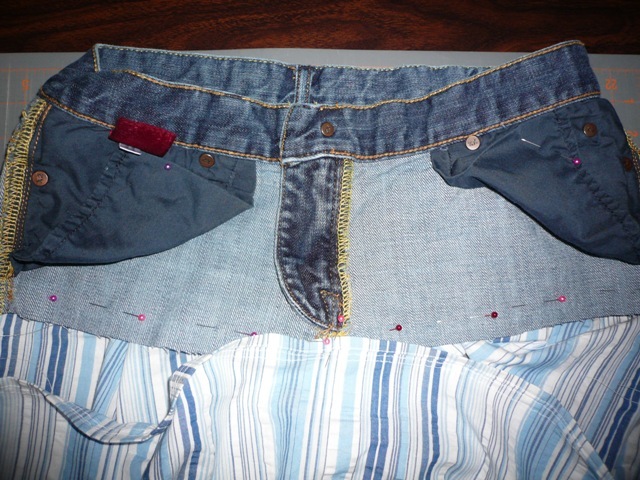 Fold one leg over the other and cut off about 1 to 1 1/2 inches below the bottom of the zipper, an equal distance from waistband. I made the mistake of measuring from the bottom of the legs and had to adjust. The skirt I made is adult-sized. I used one yard of 44" wide shirting cotton. Cut the fabric in half, so you're left with two pieces 44" by 18". Cut edges straight, if needed. Lay pieces flat, one on top of the other, right sides together. Pin short sides. Sew down both short sides with a 5/8" seam. 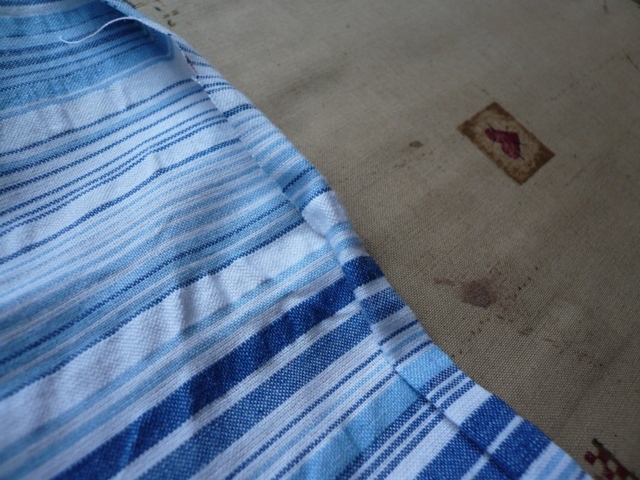 Finish seams. Press open or to one side. Serge (I'm so jealous) or zigzag one edge of the big loop of fabric you've just created. Fold in half and mark the center point between seams on both sides. Ignore the fact that I hemmed the upper edge - it was too bulky and I don't recommend it. On upper edge, stitch 2 rows of long basting stitches, starting and stopping 1/4" before and after each seam. Stitch first row 5/8" from upper edge and second row 1/2" from upper edge, leaving long tails of thread. Mark 5/8" from lower edge of jeans with pins or a pen. Pull strings at one seam up to center pin until fabric is gathered enough to lay flat. Knot tails at each seam. Pull gathers apart until fairly evenly spaced and pin in place to wrong side of jeans with edge even with marking pins. You almost can't use too many pins here, just make sure you take them out as you sew. Otherwise my mom might show up at your door. Repeat gathering and pinning around entire skirt. I'm not usually a fan of basting, but I did here. I also avoid pins whenever possible, but sometimes you want stuff to stay in place while you sew it. Funny. Make sure you take out the pins you used to mark on the jeans before you start sewing, because they're a bear to take out after you've started. After basting, stitch from right side of jeans 3/8" away from edge of denim. You can stitch again 1/4" away if you'd like, but it isn't necessary if you don't want that look. Kinda wish I hadn't - it looked a little sloppy here, but after the edge frayed it helped hide it a little. Remove all the basting stitches. I did mine in a different color of thread, so they were easier to identify. Try it on (or demand whoever you're making it for try it on - you are MAKING them something after all) and mark the length you'd like it to be. Add an extra 5/8" for hem. Cut off excess. Take it off first. Fold edge under 5/8" and press. Turn edge inside fold, so you have a 1/4" hem. Stitch. Wash and trim extra threads from frayed edge, if necessary. Now, will you sign my "Can We PLEASE Change National Skirt Day to June?" petition? Thank you.